I am bringing you today a gorgeous piquant pink peppercorn pavlova (try saying that three times)! 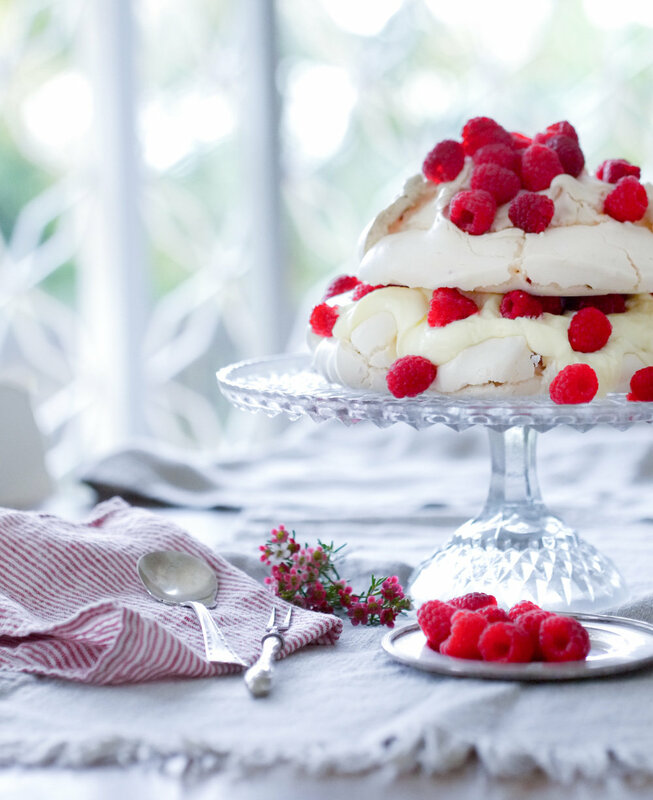 This is a beautifully simple and delicious twist on the usual pavlova. I first tried it when we moved to Singapore and invited our neighbours over for a barbecue and they brought the dessert. It was the start of a great friendship…and of my pestering for this pavlova recipe from Jane. Everybody needs a good signature dessert and this one ticks all the boxes – it is easy to make, looks impressive and tastes delicious. Preheat oven to 120ºc. Before starting, make sure your bowl and electric beaters are scrupulously clean as any kind of fat will stop the whites from whipping to perfection. To do this, clean the bowl and beaters with a little white vinegar on a piece of kitchen towel. Once you are gleamingly clean, get whipping. Start beating the egg whites and when soft peaks start to form, very gradually add the sugar and beat until each addition is dissolved. The egg whites will become glossy and stiff peaks will form. Add the vinegar and beat to combine. (To check that the sugar is all dissolved, rub a small amount of the egg mixture between thumb and forefinger. It should be silky not grainy). Draw 2 x 18cm circles with pencil onto baking paper (turn the baking paper upside down so that the pencil is on the bottom and won’t touch the meringue) and then spread the meringue mixture to form two circles and place on a baking tray. Bake in the oven for 1 hour and then leave in the oven to cool with the oven door ajar for another hour (or as long as possible). This is to ensure that the meringue is completely dry. To assemble, whip the cream until thick but still spreadable. 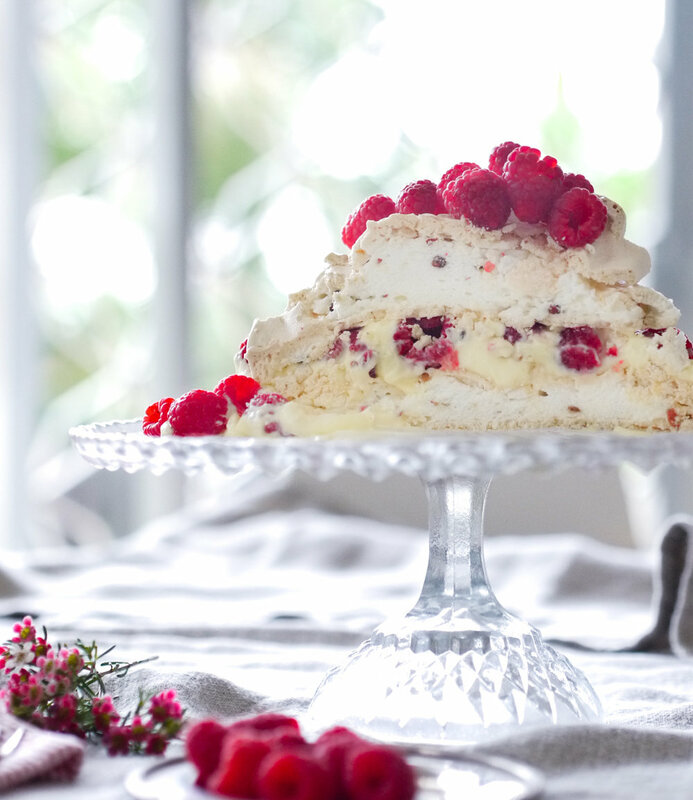 When the meringue is cold, place the first meringue round on a cake stand or serving plate and spread with cream, layer with raspberries, then top with the second meringue round and decorate with more raspberries.